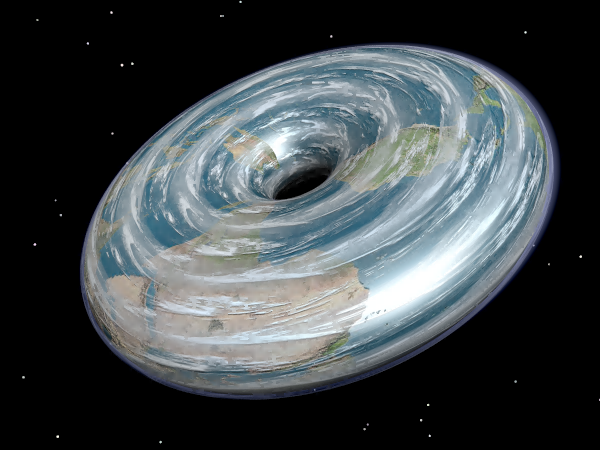 One question at Io9 that came up when they published my Double Earth analysis was “What about a toroidal Earth?” This is by no means a new question, and there has been some lengthy discussions online and earlier modelling. But being a do-it-yourself person I decided to try to analyze it on my own. 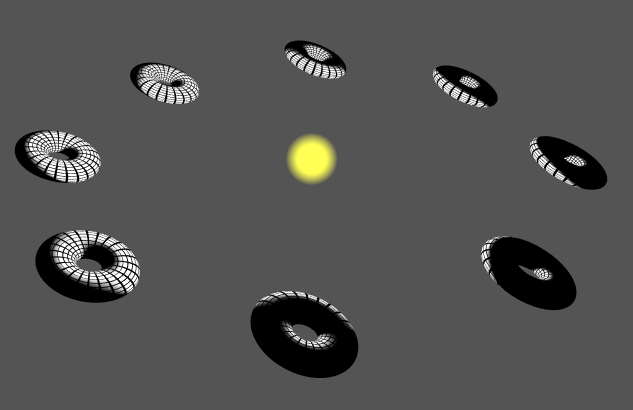 It is not obvious that a toroid planet is stable. For all practical purposes planets are liquid blobs with no surface tension: the strength of rock is nothing compared to the weight of a planet. Their surfaces will be equipotential surfaces of gravity plus centrifugal potential. If they were not, there would be some spots that could reduce their energy by flowing to a lower potential. Another obvious fact is that there exists an upper rotation rate beyond which the planet falls apart: the centrifugal force at the equator becomes larger than gravity and material starts to flow into space. The equilibrium shapes of self-gravitating rotating ellipsoidal planets have been extensively analyzed. Newton started it (leading to some early heroic expeditions to ascertain the true shape of Earth), Maclaurin refined it, Jacobi discovered that for high rotation rates ellipsoids with unequal axes were more stable than the oblate ellipsoids of Maclaurin. Chandrasekar has a nice history of the field. Since then computers have become available, and analytical and numerical calculations of more complex or the relativistic case have been done. Similarly, equilibrium states of self-gravitating toroid shapes have been examined by Poincare, Kowalewsky and Dyson (Dyson 1893, Dyson 1893b). Indeed, one can at least in theory spin up an ellipsoidal planet into a ring, although there is plenty of potential for complex wobbles that destabilizes the whole system and it looks like there is a “jump” to the ring state. The ring may itself be unstable, in particular to a “bead” instability where more and more mass accumulates at some meridians than others, leading to breakup into two or more orbiting blobs. 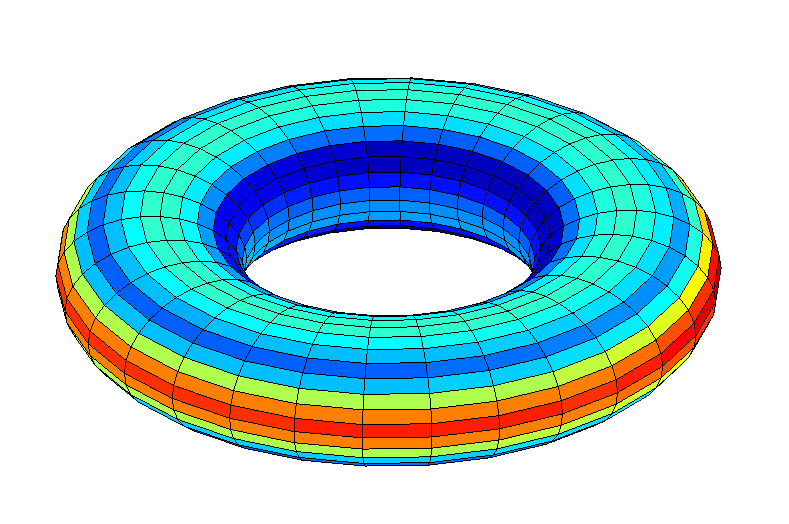 Dyson analysed this case and found it relevant when the major radius / minor radius > 3 – thin hoops are unstable. 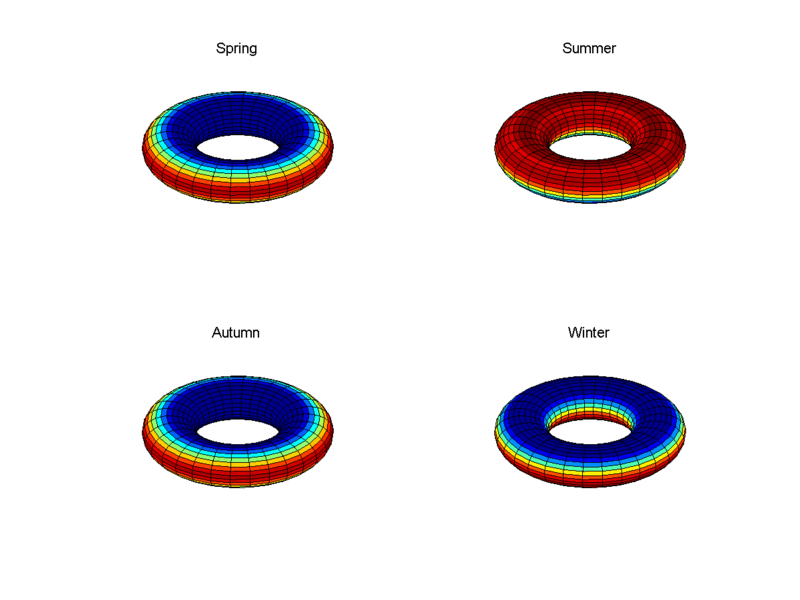 There is also a lower rotation rate where the ring become unstable to tidal forces and implodes into a “hamburger” or ellipsoid. So the total mass and angular momentum needs to be in the right region from the start. It looks like a toroid planet is not forbidden by the laws of physics. It is just darn unlikely to ever form naturally, and likely will go unstable over geological timescales because of outside disturbances. So if we decide to assume it just is there, perhaps due to an advanced civilization with more aesthetics than sanity, what are its properties? I will call the two circles along the plane of rotation the equators (the inner and outer). When it does not matter which one I talk about I will just call it “the equator”. As for the poles, they are the circles furthest away from the equatorial plane. Hubward is towards the rotation axis, rimward is away from it. Planewards is towards the equatorial plane. North is towards the closest part of the North Pole circle, south towards the closest part of the South Pole circle. How does gravity work on a toroid planet? 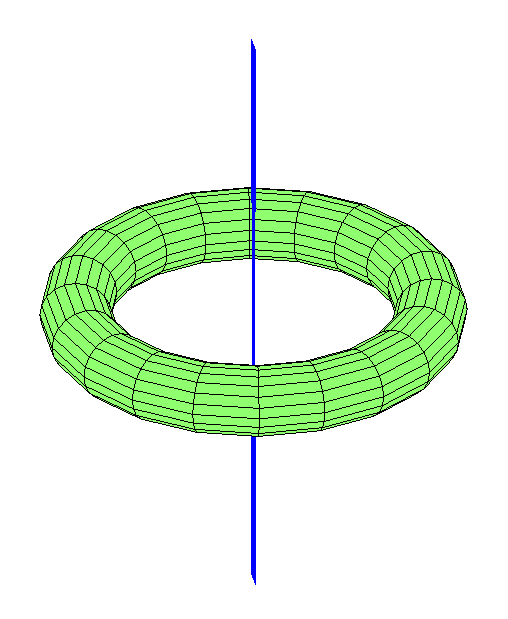 The case of a very large main radius torus is essentially a cylindrical planet. In this case the gravitational force falls off as 1/r, where r is the distance from the axis. The total force on any section will be proportional to the total mass (proportional to R, the major radius) and the gravitational force (proportional to 1/R), so the overall force will be constant as we increase R. Adding some rotation will balance it. The surface gravity is 2G rho/r, where rho is the mass per unit length. So as long as the surface gravity is big enough (by having a small r) this will overcome the centrifugal acceleration and stuff will indeed stay down. But things are much harder to guess for small radius torii. I decided to use a Monte Carlo method to estimate the equilibrium shape. Given the total planetary mass and angular momentum, I start out by distributing a number of massive but infinitely thin rings (with the potential borrowed from this physics exercise – it is a good thing electric and gravitational potentials look the same in classical physics). I calculate their joint potential and added a centrifugal potential. 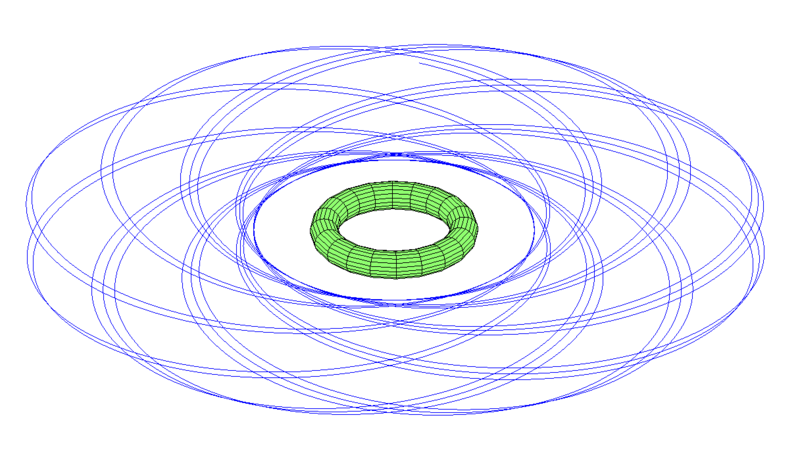 This allows me to approximate equipotential surfaces and “fill” the potential near the center of the torus with more and more rings until their mass correspond to the planetary mass. I recalculate the angular speed based on the new mass distribution. Then I repeat the process until the planet either flies apart, implodes into a ball or enough iterations go by. This is not the most elegant way of doing it (the literature uses series expansions in toridal harmonics), but it works for me. The main result is that toroid planets look feasible for sufficiently large enough angular momentum and mass. The cross-section is neither circular nor elliptic but rather egg-shaped, with a slightly sharper inside curvature than on the outside. 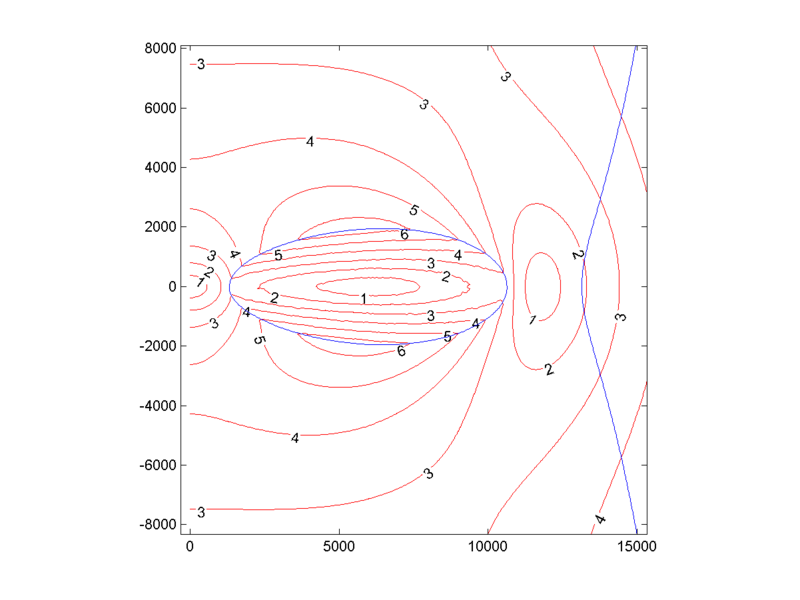 While these planets are stable in my simulation, the range of feasible values is not huge: most combinations of mass and angular momentum are unstable. And I have not examined the tricky issue of bead instability. I will look at a chubby toroid of one Earth mass and a small central hole (“Donut”), and a wider hoop-like toroid with 6 Earth masses but more earth-like gravity (“Hoop”). 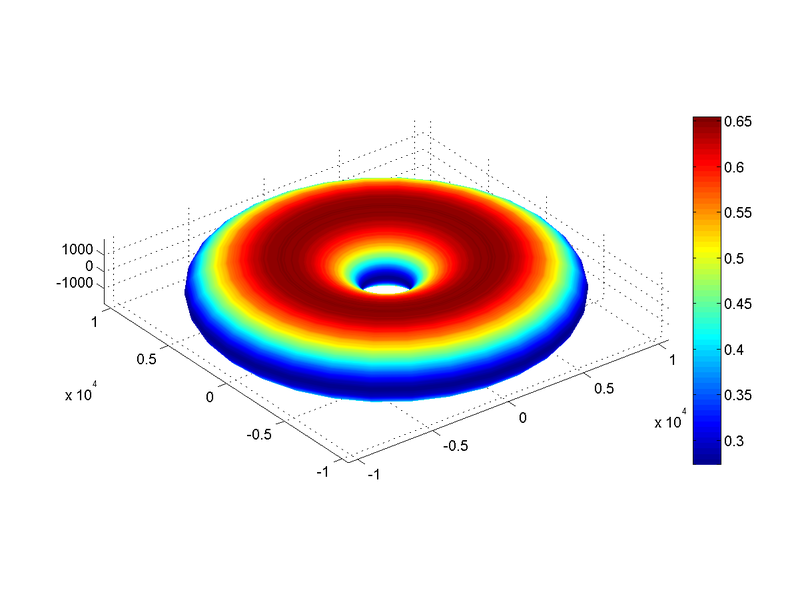 Figure 1: Local gravitational acceleration (m/s2) around Donut, as experienced by a co-rotating object. Donut has a hubward/interior equator 1,305 km from the center, and a rimward/exterior equator 10,633 km away. The equatorial diameter is 9,328 km. The planet extends 1,953 km from the equatorial plane, with a north-south diameter of 3,906 km. The ratio of the diameters is 2.4. The north-south circumference is 21,587 km (0.54 times Earth), while the east-west circumference is 66,809 km (1.7 of Earth). The total area 8.2*108 km2, 1.6 times Earth. The total volume is 1.1*1012 km3, within 1% of Earth (after all, Donut was selected as a roughly one Earth mass world). The Volume/area = 1300, 61% of Earth: there is more surface per unit of volume. One day is 2.84 hours long. 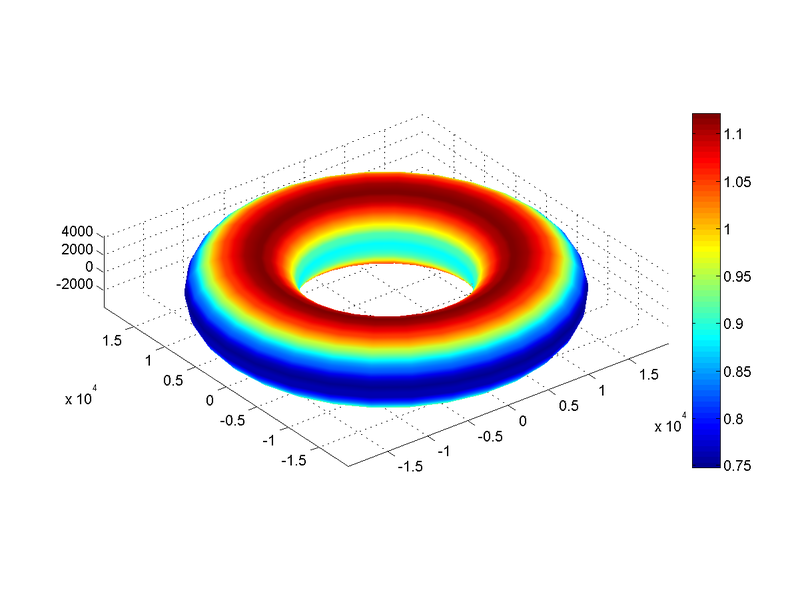 Figure 2: Local gravitational acceleration around Hoop, as experienced by a co-rotating object. Hoop has a hubward/interior equator 8,633 km from the center, and a rimward/exterior equator 19,937 km away. The equatorial diameter is 11,304 km. The planet extends 4,070 km from the equatorial plane, with a north-south diameter of 8,141 km. The cross-section has roughly the 4:3 ratio of an old monitor. The center of mass circle is 14,294 km from the center. The north-south circumference is 30,794 km (0.77 of Earth) while the east-west circumference is 125,270 km (3.1 times Earth). The total area is 2.5*109 km2, 4.9 times Earth, and the total volume 6.5*1012 km3, 6 times Earth. The volume/area = 1500, 70% of Earth. The day is 3.53 hours. So, what is life on these torus-Earths? The surface gravity depends on location. It is weakest along the interior and exterior equator, while strongest slightly hubward from the “poles”. This can be a fairly major difference. 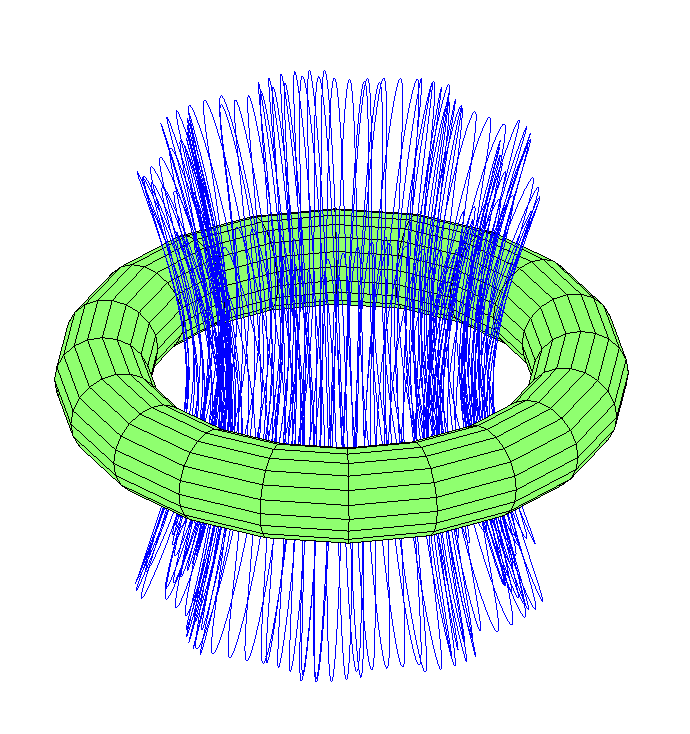 Figure 3: Surface gravity (m/s2) of Donut. Donut has just below 0.3 G gravitation along the equators and 0.65 G along the poles. The escape velocity is not too different from Earth, 11.4 km/s. The geosynchronous orbit of Donut is very close to the outer equator, less than 2,000 km up. A satellite orbiting there will stay over one spot, but unlike on Earth it will not be able to cover a hemisphere with transmissions, just a smaller region. On the other hand, the circumferential velocity at the equator is 6.5 km/s, making launches easier. Launching east a rocket needs just 4.9 km/s velocity to escape. There is a central unstable Lagrange point at the middle of the hole. 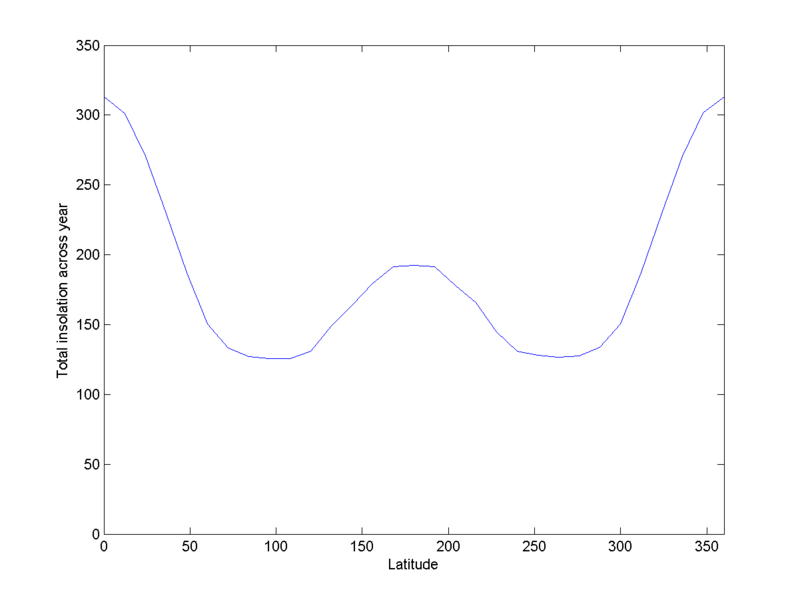 A satellite will be attracted to the equatorial plane, but any deviation outwards will be amplified. 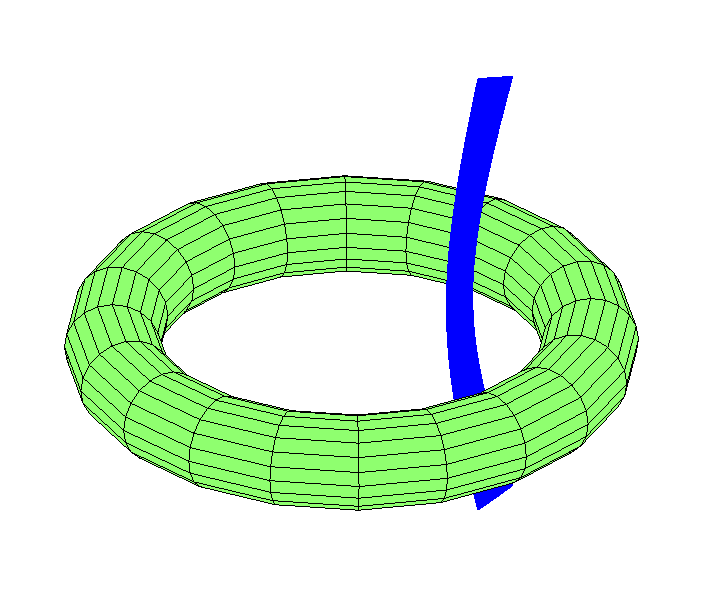 Figure 4: Surface gravity (m/s2) of Hoop. Hoop has 1.1 G gravity along the poles but just 0.75 G along the rimward equator. The hubward equator has slightly higher gravity, 0.81 G.
Escape velocity is 19 km/s (remember, the planet weighs in at 6 earth masses). Rimward equator velocity is 9.9 km/s – a rocket will need to provide 10 km/s to escape if it launches eastward. Note again that having a low gravity equator and high gravity poles does not mean stuff will roll or drift towards the poles: as mentioned before, the surface is an equipotential surface, so gravity (plus the centrifugal correction) is always perpendicular to it. But an air mass flowing towards the pole will be squeezed together. In fact, the different gravities will create horizontal pressure differences that are going to interact with temperature differences to set up jet streams in nontrivial ways. First, the nights and days of these worlds are very short. There is not much time for the environment to cool down or heat up during the diurnal cycle. What really matters is how much light they get over longer periods like seasons. Assuming these worlds orbit at an Earth-like distance from a Sun-like star, these are long enough to matter. Torus-shaped worlds have an outer rim that is not too different from a normal ellipsoidal planet. Days occur with a sunrise at the eastern horizon and a sunset at the western horizon. The sun moves along a great circle that slowly shifts north and south over the year, giving seasons. However, on the interior side things are different. Here other parts of the planet can shadow the sun: to a first approximation we should expect far less solar energy. We can look at three different cases: zero axial tilt, 23 degrees (like Earth) and 45 degrees. For zero tilt the hubward side will never get any sunlight: the sun is always hidden below the horizon or by the arc of the world. At the poles the sun is moving just along the horizon, and slightly inwards there will be a perennial dawn/dusk. The temperature difference will be big, with the interior at subarctic temperatures: this is not entirely different from a tidally locked world, and we should expect water (and maybe carbon dioxide) to condense permanently here. The end result would be an arid (but perhaps not super-hot) outer equator, possibly habitable twilight polar regions, and an iced-over interior. 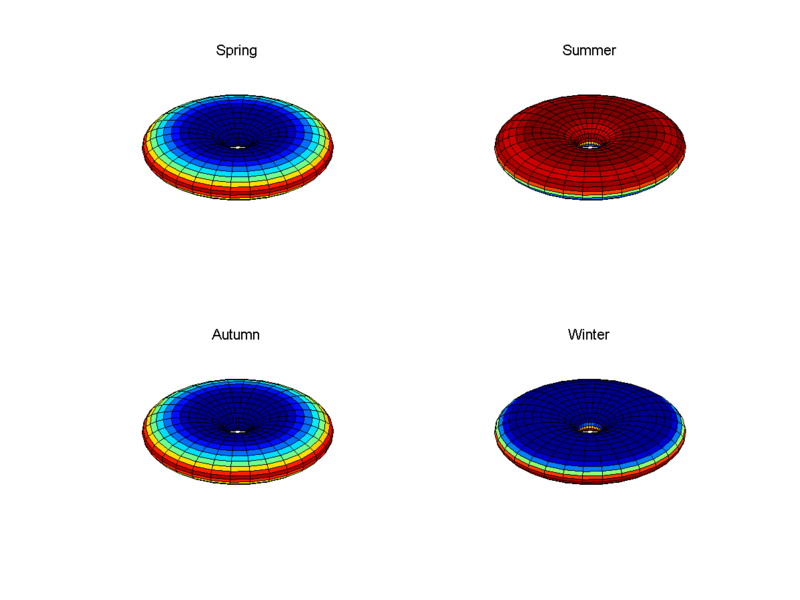 Figure 5: Seasons on Donut during spring, summer, autumn and winter. For a terrestrial 23 degree tilt spring and autumn will be like the zero tilt case: light along the equator, dark inside the hole. But during summer and winter the sun has a chance to shine past the rim and onto the opposite side of the hole. Also, there will be large regions with midnight sun or perpetual night in summer and winter, respectively. On Earth the Polar Regions are small, but here they are at the very least long contiguous circles. The spring dawns and autumn twilights on the hubward side would have some amazing deep colors, since the sun would be rising past the atmosphere of the other side (already pre-dawned or pre-twilighted, you could say). This would be added to the local atmospheric optics, producing some very deep reds and color gradients. Just before or after sunrise/sunset parts of the corona would also be visible. These sights would be more impressive if they weren’t so brief. On Earth, the sun moves close to 15° per hour: at its fastest, the sun moves one diameter in 2.1 minutes. On Donut solar motion is 127° and on Hoop 102°: a sunrise takes 15 or 19 seconds, respectively. Coming in at a slanted angle and the delaying effects of atmospheric refraction would prolong things a bit, but to an Earthling it would still look very brief. Standing on the hubward surface looking up, the other side will be about 20 degrees across on Hoop and 30 degrees on Donut – an enormous arc across the sky. On the inside, having lit parts of the other side would light things up like moonlight. But the total area could potentially be much larger, making for some very bright (if still nightly) nights. For Hoop, this is potentially 16,000 times stronger than Earth moonlight (8000 lux) when the entire opposite side is lit (assuming an Earthlike albedo), making a night as bright as an overcast day. On Donut this reaches low daylight levels (12000 lux). However, this is the “full opposing side” situation: near the equinoxes only a thin sliver is visible. Figure 6: Averaged insolation over a day on Donut during spring, summer, autumn and winter for the 23 degree case. In the case of Donut, the rather flat surface means that the northern or southern hemisphere will also catch a lot of sunlight: the total heating on the planet is larger during these seasons than in spring and autumn, unlike on Earth where it is constant since the receiving area stays constant. There are also slightly nontrivial effects due to the angle between the surface and the sunlight, making the temperate zones get slightly less energy than the Polar Regions and tropics. 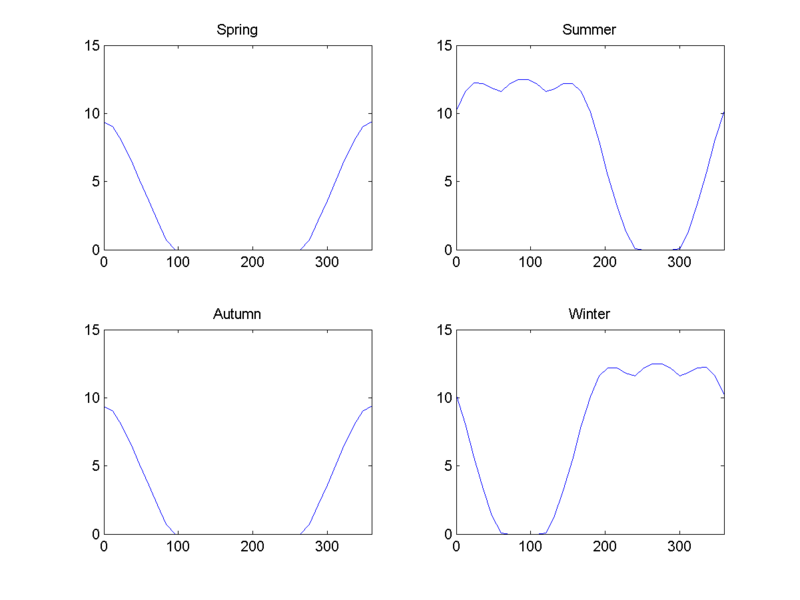 Figure 7: Averaged insolation during different seasons on Donut, as a function of latitude in the 23 degree case. 0 denotes the rimwards equator, 90 the north pole, 180 the hubward equator in the hole, 270 the south pole. The rather big difference in energy deposited at the sunlit summer side of the hole and the dark winter side of the hole will tend to drive some strong weather – but as we will see, due to the other peculiarities of these worlds evening out the energy differences is harder than on Earth. Overall, the total energy deposited is 2.5 times higher in the rimward equatorial area than in the temperate and polar areas, and the inside of the hole has about a fourth less energy than the surroundings. Figure 8: Energy received across a year for different latitudes on Donut. Hoop has less self-shadowing. More importantly, it is not as flattened as Donut. Figure 9: Average insolation during a day on Hoop, 23 degree case. 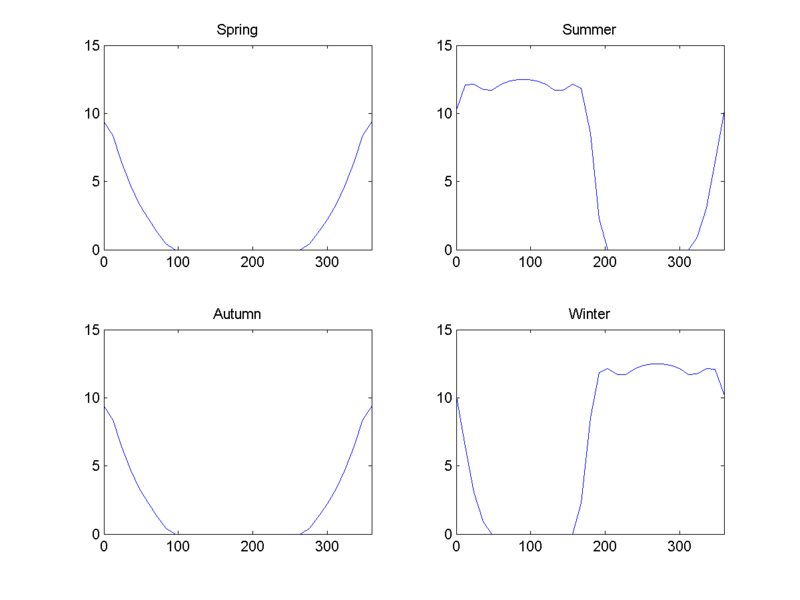 Figure 10: Averaged insolation during different seasons on Hoop, as a function of latitude in the 23 degree case. 0 denotes the rimwards equator, 90 the north pole, 180 the hubward equator in the hole, 270 the south pole. The seasons at first look like what one would expect. A spring and autumn where the hubward regions are in shadow, summers and winters where one polar circle gets a lot of sunlight and the other far less while the hubward regions get light. Note that this produces a seasonal cycle in the hubward area that is at double frequency of the rimward regions (this is true for Donut too): the warm weather happens in “July” and “January”. Figure 11: Energy received across a year for different latitudes on Hoop. Somewhat non-intuitively compared to Donut, here the hubward equator does get more sunlight across the year than the Polar Regions . We can hence expect the climate to be a bit like on Earth, with colder Polar Regions and warmer equatorial regions. The rimward equator still gets 60% more energy, though. Perhaps the most surprising thing is that for high enough axial tilt we get four cold zones and four warm! The easiest way of understanding this is to consider a spherical planet with 90 degree axial tilt like Uranus. For half of the year the North Pole is turned towards the sun and most of the hemisphere has constant daylight. As equinox approaches the axis points sideways, so the planet gets evenly irradiated. The end result is that the poles get more energy than the equator. On a torus world the same dynamics holds true, but now the Polar Regions are circular too. Figure 12: Energy received across a year for different latitudes on Hoop in the 45 degree case. For Hoop the difference is not enormous, about 10% in total insolation. The rimward equator is mildly hotter than the Polar Regions and the hubward equator. Donut slightly larger differences but in practice most of the surface is dominated by the mildly warm polar regions. The rimward equator is only slightly warmer than the cooler rimward temperate areas. The surface area is larger than on Earth, and the volume/area ratio is smaller (For Donut the ratio is 1,300 km, for Hoop 1,500 km, for Earth 2,124 km). One might hence suspect that more thermal energy is leaking out, reducing volcanism and plate tectonics. However, even a small amount of tidal heating due to influences from the sun might release plenty of energy stored in angular momentum. In the case of Hoop there are also 6 times more radioisotopes inside the planet than on Earth but only 5 times more surface area. Continental drift would be affected by the different inner and outer radii. A circle r km inwards from a circle of radius R will be just 2*pi*r km shorter, and the relative change will be r/R. So for Hoop a continental plate drifting from the outer equator across a pole to the inner equator will have to shrink to 43% of its original width to fit. On Donut the effect is much bigger: it becomes 12% of its original width! Hence continental plates moving hubwards on the inside will tend to experience folding, while plates moving rimwards on the inside will experience rifting. Expect some rugged landscape and archipelagoes near the hubward equator. Gravity affects the height of mountains. On Hoop the difference is not enormous compared to Earth, but on Donut mountains at the poles can be 1.5 times higher (maximum around 12 km) and near the equators 3 times higher (24 km). Combined with the ruggedness near the hole this might make for some dramatic landscapes. The fast rotation will likely produce a strong magnetic field; unlike on Earth the polar regions will not have auroras since the field lines will not intersect the surface… I think – figuring out dynamo currents in a toroid iron core sounds fun but is beyond me. We have seen that the light levels change a lot, and that would make us suspect plenty of wind transporting heat from hot sunlit areas to cool shadowed areas. However, the high rate of rotation means that the Coriolis Effect will influence air and water flows to a large degree. The Coriolis Effect makes air moving towards or away from the rotational axis bend away, since it has more or less velocity than the ground. A parcel of air “at rest” near the equator has a lot of actual momentum since the equator is moving fast around the rotation axis: if that air were to flow pole-wards it would now have a noticeable velocity eastwards or westwards. This is why the global airflow is not just simple convection cells from the equator towards the poles: as heat is transferred using air polewards the air flow gets twisted around, producing trade winds. On torus worlds the rotation rate is 8 times faster than on Earth and the velocity differences are larger. Air hence tends to be twisted around far more, producing a more banded zonal climate than on Earth. Exactly how banded is hard to tell without detailed atmospheric calculations, but it is likely more like on Jupiter than on Earth. This in turn means that heat transfer is less effective: the temperature differences between the hot and cold regions will be bigger. It is likely that there will be inter-tropical convergence zone (ITCZ, alias the doldrums or equatorial lows) around the rimward equator, where winds approaching from north and south will blow westwards (trade winds) while warm air rises, moves away from the equator, cools and descends at a higher or lower latitude (where we should expect major deserts). The big seasonality changes especially on Donut will make the ITCZ shift north and south, triggering monsoons in some regions. However, the rapid rotation will make the Hadley cell thinner than Earth’s 30 degree size (exactly how much thinner is slightly tricky to estimate, since it also depends on the latitude-varying gravity). Big temperature differences over short distances are going to power plenty of weather, even if it is hard to predict exactly how it is going to look. Especially near the hole on Donut seasonal weather will be wild: warm air from the sunlit side will flow through it in a big vortex, balanced by cool winds from the dark side circulating in the opposite direction. 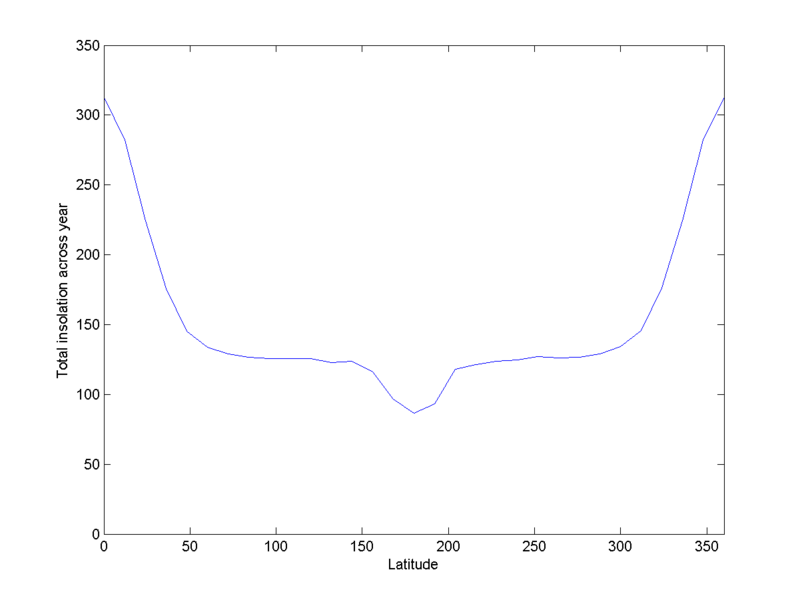 The scale height, how quickly pressure drops off with altitude, is proportional to gravity. Hence clouds will be 3 to 1.5 times taller on Donut, while Hoop clouds will be more Earth-like. Like on Earth cyclones can form at the mid-latitudes. Stronger Coriolis forces would make tighter hurricanes, about four times smaller. However, they would tend to last longer on Donut (since the high scale height gives them far more air to play with). Wind speeds depend on the temperature difference between the top of the atmosphere and the ocean, which could vary a great deal across the year. The amount of water on either world is not vastly different from Earth, although Hoop’s 6 times greater mass with merely 5 times greater area would provide it with 20% more water volume from the initial accretion (so for the same coverage the oceans would be 20% deeper). The higher mass might also accumulate more cometary infall, but it is hard to judge how much this would be. The big seasonal temperature swings will be more pronounced far from the moderating influence of oceans: continents near the poles will be more extreme than equatorial ones. Whether they can maintain ice caps throughout polar summer depends on their layout and the background temperature; since ice reflects away sunlight effectively and the Coriolis Effect can keep air from warming them it is likely. The same for sea ice, although here there is potential for warming sea currents from hubwards or rimwards. Since the flow of water in oceans is constrained by the shape of the basins, the Coriolis Effect will merely drive gyres rather than prevent north-south flow; large oceans like the Pacific will be more east-westerly than narrow north-south oceans like the Atlantic. The low gravity near the equator will make some tall waves on Donut: they can be expected to be three times taller than on Earth. Waves at Donut’s poles are still 150% of the ones on Earth. Hoop is closer to normal (133% taller at the equator, 90% height at the poles). The wild hubward summer-winter weather on Donut will likely drive some amazing storm waves. From these considerations, it seems likely that one could have a fairly Earth-like biosphere on Donut and Hoop. Storms, severe weather and long winters are things species on Earth have adapted to fine. There might be interesting differences in ecosystems based on latitude, since there are more variation between different bands than on Earth (gravity, seasonality, temperatures etc.). Also, at least on Hoop each band has a much larger surface area: there is more room for species diversity within each eco-zone. Would these worlds be able to keep moons? A moon orbiting exactly in the equatorial plane in a circular orbit it would just feel a potential looking like it came from a spherical planet of some intermediate density. However, if it orbited in slightly eccentric orbit things would change. The potential field close to the planet falls of more slowly than 1/r (the answer for normal spherical planets): the Kepler ellipse is no longer the right solution. And as soon as the orbit becomes slightly tilted things turn even more complicated – now the moon will feel the flatness. In many ways this is the problem facing satellite designers already: Earth is oblate enough that orbits are affected. This problem was dealt with in the earliest days of spaceflight (see Wikipedia, (Tremaine & Yavetz 2013) or (Nielsen, Goodwin,& Mersman 1958)). Basically, the main effect is that an elliptic orbit precesses – it slowly changes direction in space, for Earth largely depending on the inclination. Eccentricity can also drift, which is a bigger deal. 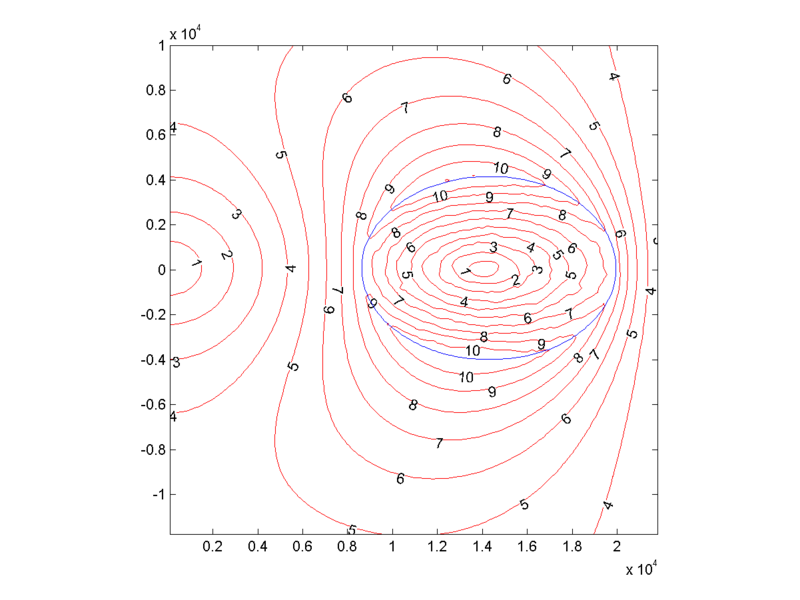 In any case, for a toroid world these effects are far larger: the multipole moments (measures of just how non-spherical the field is) are of course enormous. In fact, they are so big that the standard methods no longer work and we need to do computer simulations. Running a simulation (where I did not use the full torus potential, but rather a ring of 30 masses) demonstrate some of the possibilities. Indeed, an equatorial elliptic orbit looks nice and stable but precesses into a rosette. A nearly polar orbit has even more precession, not just making it rosette around in a plane but also slowly precessing the plane. The moon could appear in the sky in any constellation. In fact, one can have a moon bobbing up and down over a particular longitude in a bent rectangular region. And given some longitudinal velocity, it will move around the hole, filling out a wobbly hyperboloid of one sheet (a “vase orbit”?). What about orbits that actually go through the hole in just one direction? It turns out that there are plenty of “figure 8”-like orbits that go through, precessing to form a larger torus-shaped tangle. Note that the orbit is a bit “elliptic”, with a lopsided figure 8. From “apogee” above the rimward equator it will go through the hole and turn over the opposite side, where it will have a “perigee” near the antipode of its starting point. Then it will go through the hole, coming out near where it started – but precession will make it wind along the torus. Hence the two-sheet appearance of the entire orbit. These simulations should be taken as first sketches, since the real case requires quite a bit of computational care. My numerical precision is not good enough to tell what the long term stability truly is. Hoop and Donut have even messier gravity fields since they are flattened, and there will of course be perturbations due to the sun and other planets. Tidal forces are an issue. Imagine a moon orbiting equatorially outside a torus world. It causes a bulge of water and rock beneath it. The rapid rotation will tend to push the bulge ahead of the moon (assuming the moon orbits in the same direction the planet turns and is above geostationary orbit). The gravity of the bulge will hence drag the moon forward, imparting a slightly faster motion – which in space means the moon moves outward to a slightly higher orbit. This is how Luna has absorbed a fair deal of Earths angular momentum, slowing Earth’s rotation and drifting further away. In the case of wild rotation like on a torus-world this effect is bigger: moons will tend to be pushed away and possibly lost. What happens to close moons, orbiting below the geostationary orbit? They actually move faster than the bulge, and now it slows them. That means a lower orbit. Soon they spiral inwards and become giant meteors. The same happens for retrograde moons when they are too close. Of course, if the moon is big enough it might break up due to tidal forces into a ring. The wilder orbits through the hole are likely to be destabilized by tidal forces. The bobbing orbits will tend to acquire angular momentum from the bulge, and turn faster and faster – until they crash into the planet or are lost. Some figure-8 orbits might be in the right resonance to gain and lose energy equally, but I suspect they generally have the same problem. So sadly, I suspect torus-worlds will lack the truly exotic moons. However, artificial satellites with a bit of station-keeping are still possible. Those bobbing orbits might be good for communications satellites for the hubward surface. Torus-worlds are unlikely to exist naturally. But if they did, they would make awesome places for adventure. A large surface area. Regions with very different climate, seasons, gravity and ecosystems. Awesome skies on the interior surface. Dramatic weather. Moons in strange orbits. We better learn how to make them outside of simulations.